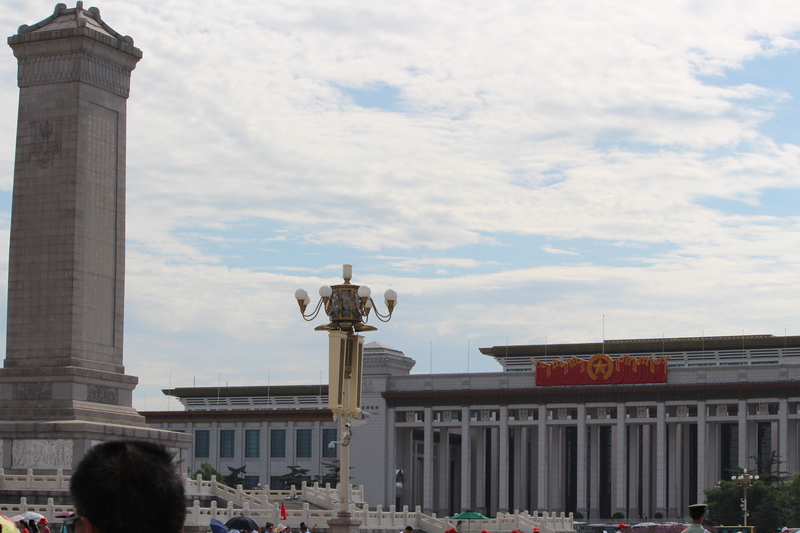 The Vastness of Tiananmen Square | Oh, the Places We See . . . Although we had arrived in Beijing one day prior to the first itinerary day of our Viking River Cruise and had a leisurely day exploring the Beijing Zoo and Lama Temple, our first “real” day found us literally running to catch up as we braved the 95-degree heat, unrelenting sun, and the enormity of Tiananmen Square. 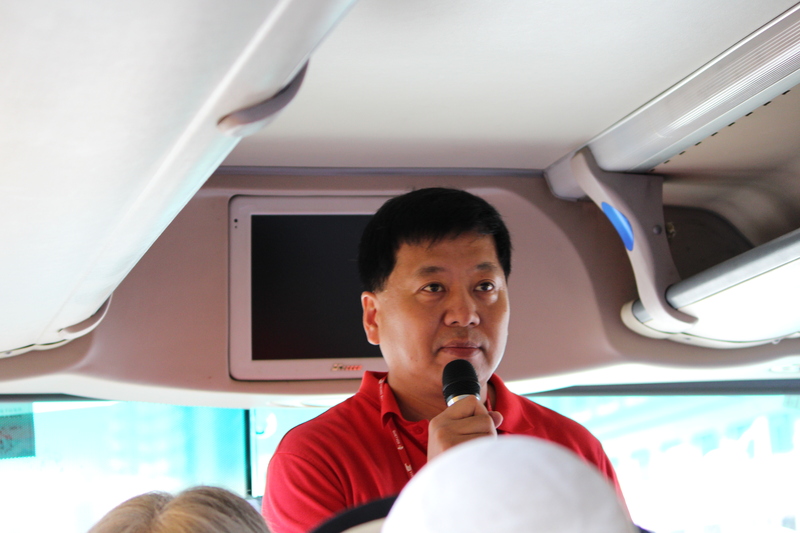 Our Viking guide, Jack Xiong, met us at the Westin Beijing Financial Street, and, after brief introductions, told us about “his” city where his wife (a police officer), his son, and he have made their home. His ease of presentation and interest in history turned us into devoted followers immediately. We already knew something about Tiananmen Square. After all, we had lived through the student protests of 1989 and watched in horror as those events came to a bloody end. And we wanted to see the site of all that. But what we weren’t prepared for was the vastness of the square, the stately symmetry of the buildings, and the many thousands of visitors. 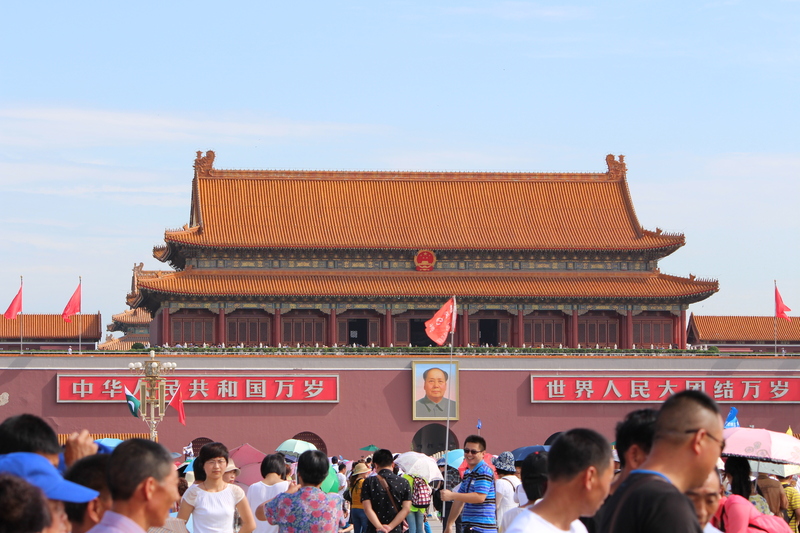 Named after Tiananmen Gate that separates the square from the Forbidden City, the present-day Tiananmen Square fulfills the vision of Mao Zedong to build the largest city square in the world. 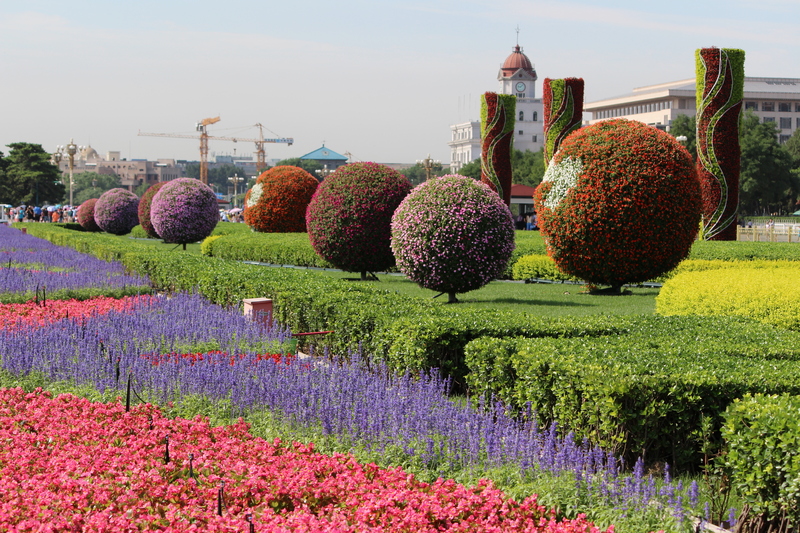 Today, the square spans 109 acres and can accommodate more than 500,000 people. But even though we had read this information, it was hard for us to imagine what it would look like in “real life.” We soon found out. Massive buildings greeted us — from this Monument to the People’s Heroes (left) to the China National Museum which houses collections from the former Museum of the Revolution and the Museum of Chinese History. 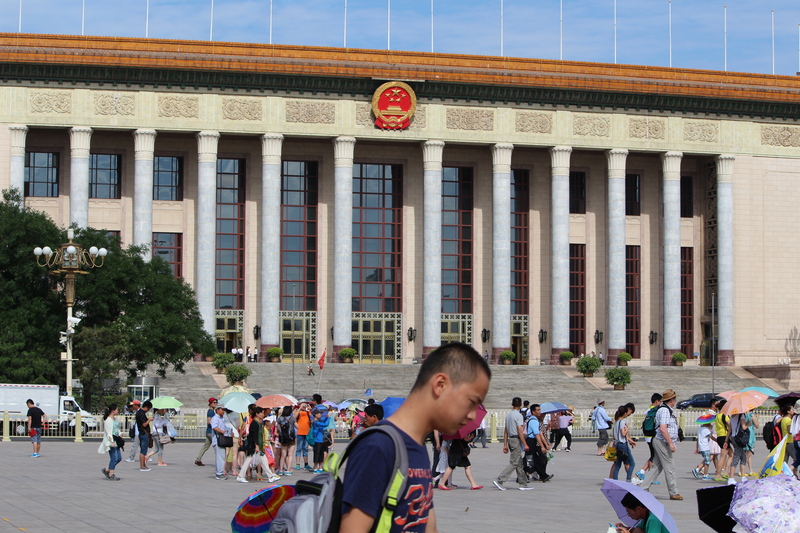 The Great Hall of the People, noted for its stateliness, clean lines, and signature red emblem, is the site of National People’s Congress meetings. From this Ming dynasty gate (pictured below), Chairman Mao (whose portrait is displayed prominently on the front) founded the People’s Republic of China on October 1, 1949. 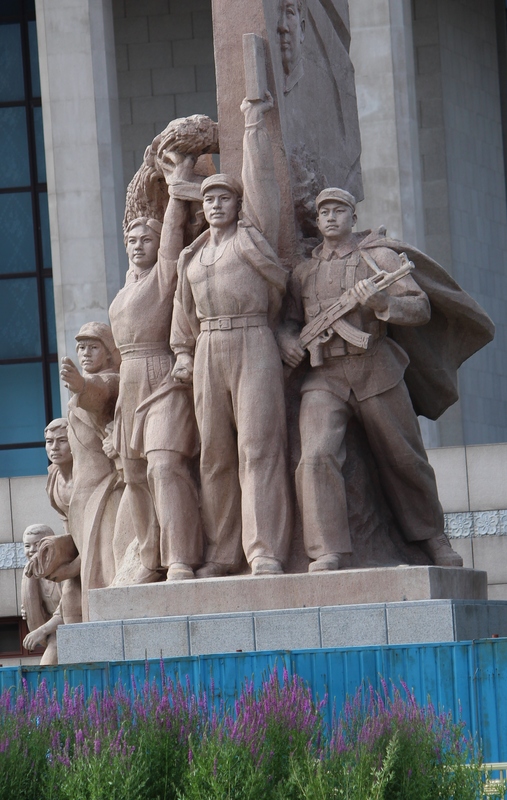 Our guide pointed out Mao’s Mausoleum (pictured below) where Chairman Mao’s casket is on view mornings and afternoons. As you can see, throngs of people formed long lines even in the hot noonday sun to pay tribute or just say they’d been there. As always, my attention turns to the people who fascinate me wherever I travel. (We were warned not to take pictures of the police, so you won’t see any of those stoic guardians of the square here.) 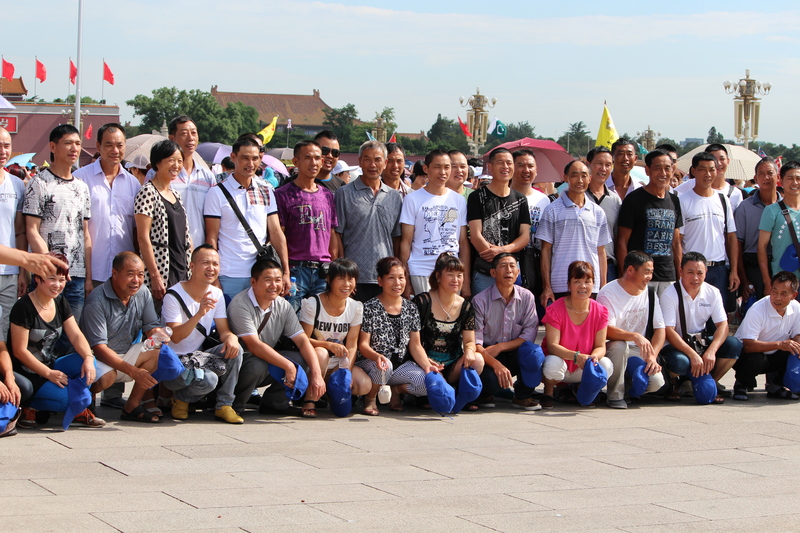 I took pictures of Chinese tourists like these folks posing for a group photo . . .
and another group following a flag-wielding leader — just as we did with Jack! 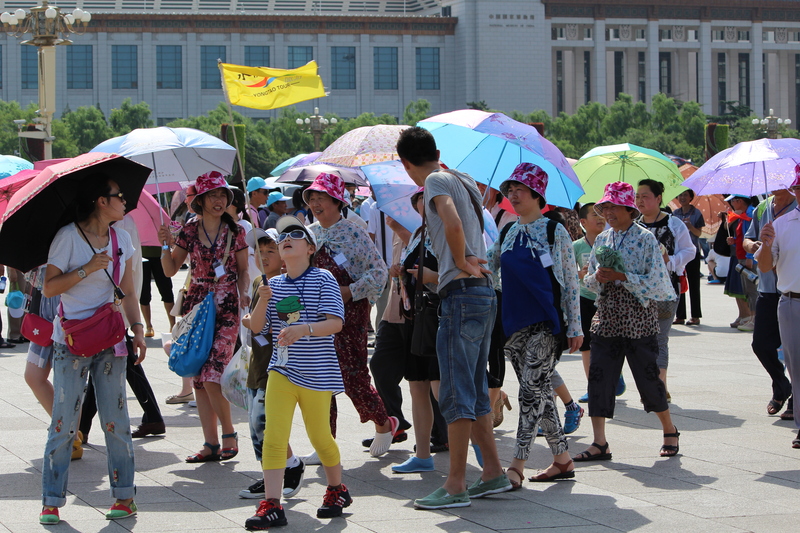 Families, too, wanted to be in pictures with historical monuments and national buildings of Tiananmen featured prominently in the background. 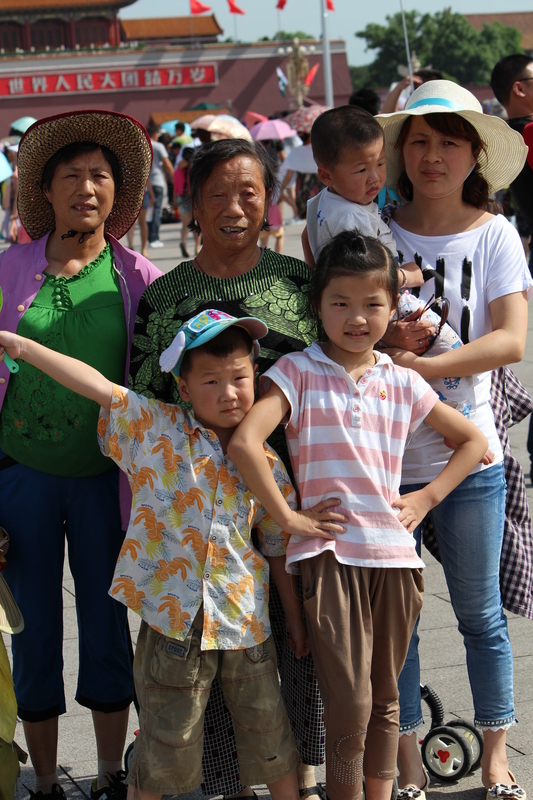 This family is centered right in front of Chairman Mao’s huge portrait. 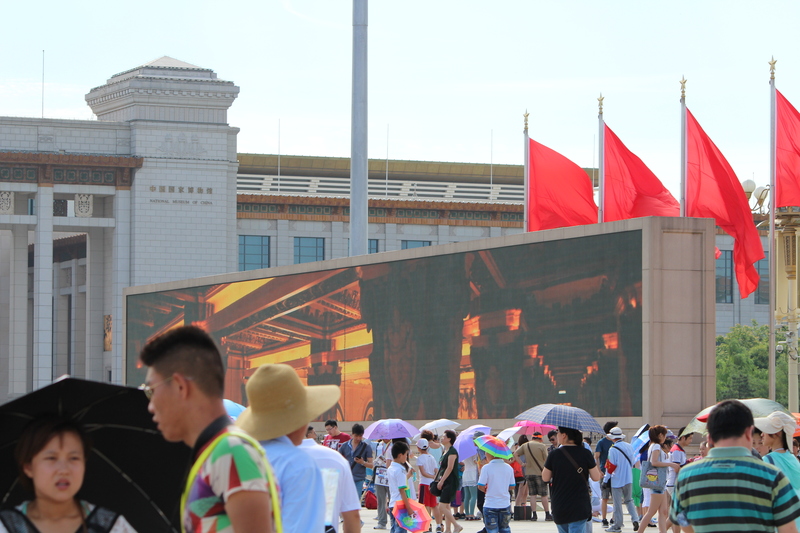 One of the surprises of the tour — and not mentioned in any of the guide books we had brought with us — was the incredibly enormous video screens near the China National Museum. 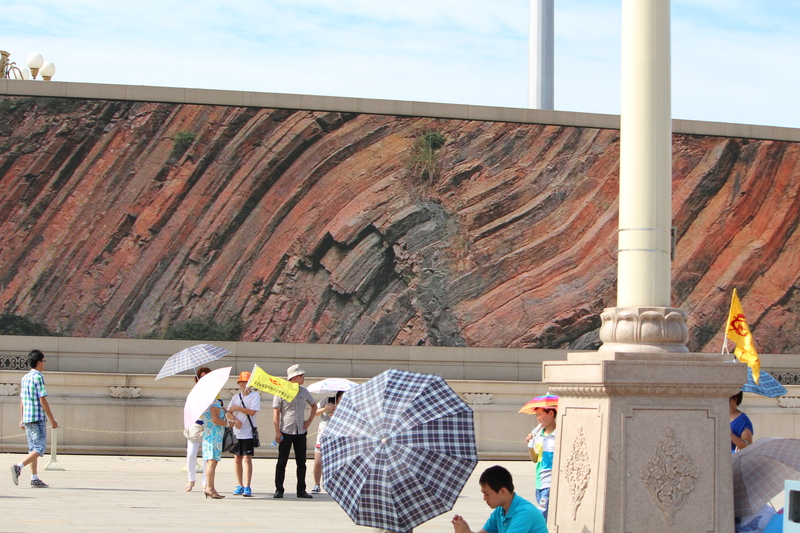 Ever-changing scenes of China appear on the screens like this one of colorful rock formations . . .
and another one of the interior of a building in China. 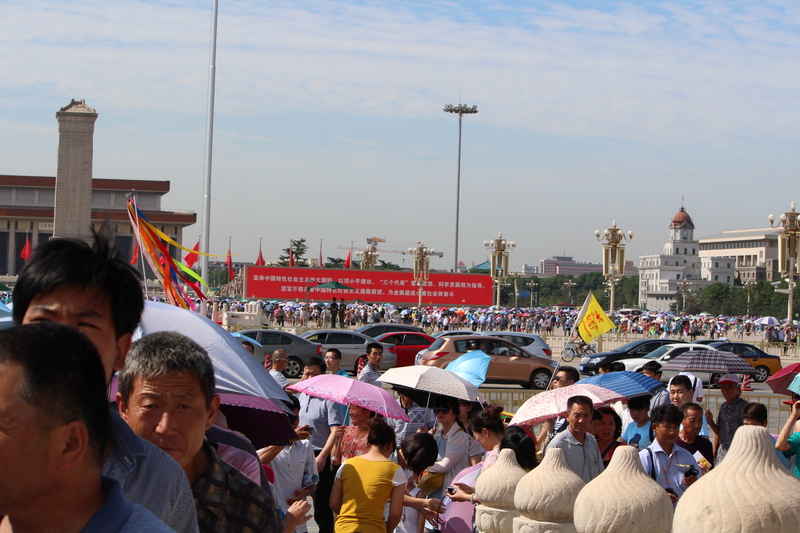 As you can see, it was people, people, and more people in Tiananmen Square. 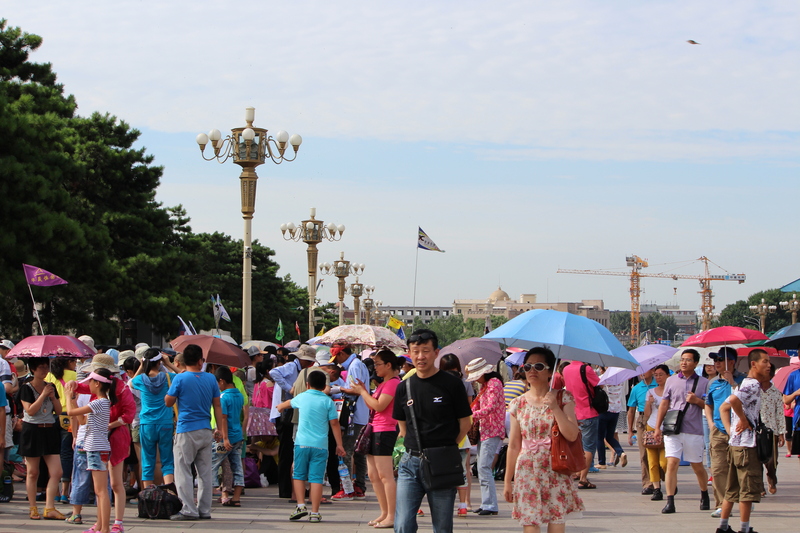 Our guide said that on any given day, there could be as many as 30,000 to 100,000 visitors. 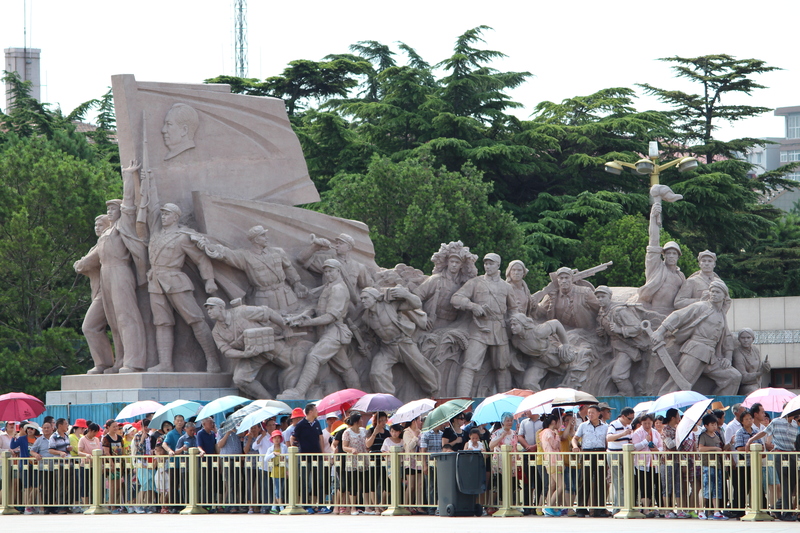 In fact, he told us, Tiananmen Square is more to some people than just a site to see — it’s almost a pilgrimage for the many who live in China and are now traveling for the first time since the economy has improved. Well, it was on our bucket list, too! If you want to follow our journey from Beijing to Shanghai, just go to the page at the top marked China. The links to other posts are there. Thanks for traveling with us! This entry was posted in Museum, Travel and tagged Beijing, China, China National Museum, Great Hall of the People, Jack Xiong, Mao Zedong, Mao's Mausoleum, Tiananmen Square, Viking River Cruise. Bookmark the permalink. 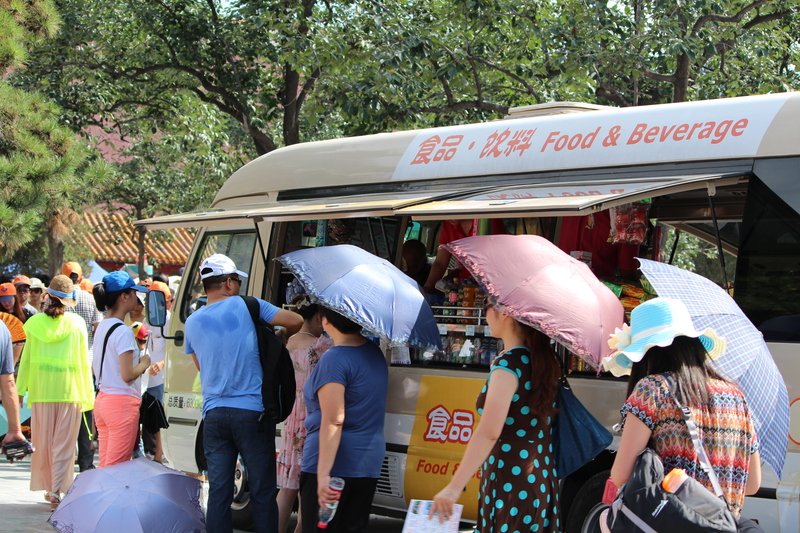 Seems like China is prospering, the locals are traveling around as well…. That’s the information we got from our guide. In fact, there were many people from rural areas that he said may not have ever seen these top visitor sites. But they’re able to do so now. Interesting! Enjoyed this. I’d love to go to China some day! I hope you get the chance to go. We really had not planned this trip very far in advance. But when the brochure came in the mail, we liked the idea and went! Thanks for reading! I’ve learned a lot, but still know so little. Thanks for any and all clarification!